Something is happening in the Pillaga in western NSW. Coal Seam Gas exploration and drilling by Santos is under concerted attack. While the protests are not new, the profiles of those locking on or taking a stand are no longer the regular sterotype. Yesterday a Coonabarabran mother of three young children, Nicole Hunter, locked on to a bulldozer for several hours. 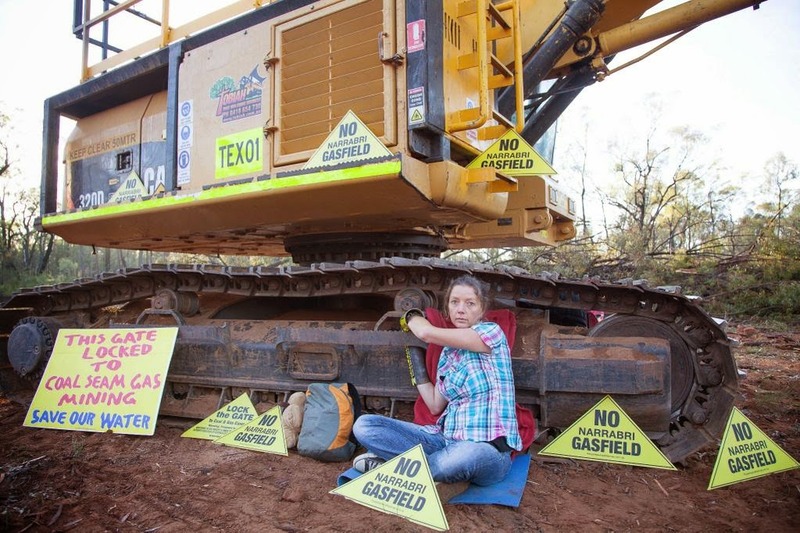 Mrs Hunter attached herself to a bulldozer to stop Santos clearing a patch of the forest for a new coal seam gas drill pad. She had a support crew from Coonabarabran. She was released after several hours without charge. She is concerned about the industrialisation of the area and the impact on underground water, the mainstay of agriculture and important for recharging the Great Artesian basin. Read the story on CSG is risky business for aquifers. "We want to raise our children on a local farm and settle here for life. We love this area, and don't want to see it industrialised. We want to preserve the character of our town and region. We don't want to see our region industrialised and our towns become boom-bust mining towns. "Our whole focus as a couple is our kid's future in the bush. We're devastated that our kids could potentially suffer the same health impacts as children in Queensland. "I'm afraid to do this, but it's worth getting arrested to defend what we’ve got here." Today a 76 year old retired Astronomer, Malcolm Hartley, stepped up and locked on to protest the impact of flaring from CSG wells on the Siding Spring Observatory. For decades Hartley worked at the Siding Spring Observatory under the exceptionally clear starry skies with little surrounding light pollution. 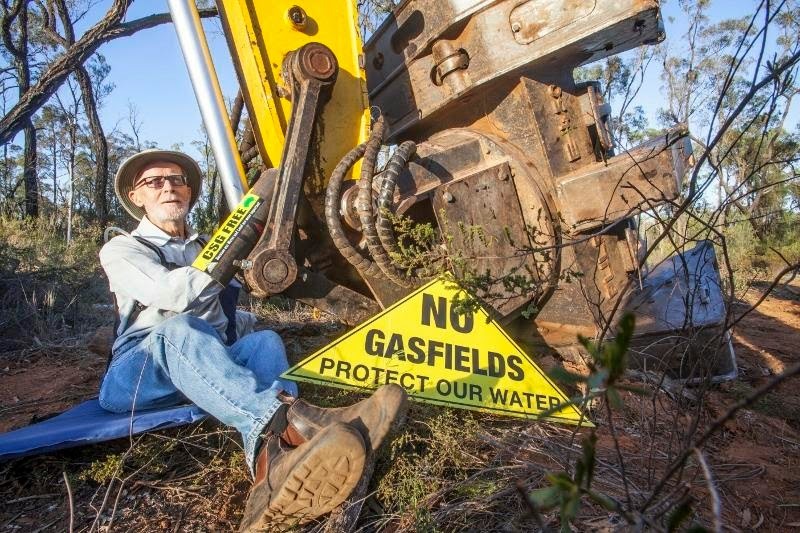 Some of the sensitive work there is now under threat from gasfield flaring. “I don’t want to see the industrialisation of the bush and I don’t think our Government is thinking clearly about the damage that Santos will do to this forest and the region. “I’ve been to the Queensland gasfields. I’ve seen what they want to turn the Pilliga into. I don’t want to see this special place given over to an industrial gasfield, and the wildlife driven out, just because its public land and the Government and Santos think it's expendable. “If there’s no private owner or leaseholder to lock this gate, then the people of Coonabarabran, who love this forest, will have to do it. “The chief Scientist recommended an overhaul of the regulation of coal seam gas last month. We’re still waiting for the Government to respond, and yet, here Santos is, clearing the bush and putting down more wells. It’s not right that reform of this industry should come too late to protect the Pilliga and its dark starry skies." Neither of these people are the regular profile of serial protestors. These are ordinary people who are concerned with a mining and regulatory system clearly out of control that has lost it's social licence. The NSW Government continues to uphold a mining system that has fallen foul with local communities. Inaction by the government has been the response so far to over 40 spoken presentations from local community members called on the Planning Assessment Commission in Narrabri to reject the Santos drilling program. In October the NSW Chief Scientist Professor Mary O'Kane recommended in a report a major overhaul of coal seam gas laws in NSW, citing major regulatory failings, but with no response so far from the Baird Government. The NSW Environmental Defenders Office (EDO) commented that "CSG is contentious in the NSW landscape. The burden of enforcing CSG laws has been carried by the community for too long. It is vital that the Government implement the recommendations of the Chief Scientist’s Report so that the community can be assured there will be effective and science-based regulation of the industry and protection of the environment."